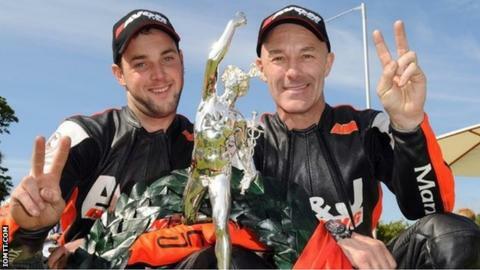 The two most successful competitors in Isle of Man TT sidecar history are reuniting for the 2016 event, it has been confirmed. Dave Molyneux and Dan Sayle have 25 TT wins between them but have not raced together at the event since winning the only race in 2009. Molyneux, 51, has raced with a dozen passengers over 30 years and said Sayle is the is the "best of the lot." The pair won both races in 2004 and another the following year. Sayle partnered Nick Crowe to the long-standing outright sidecar lap record in 2007 which was only bettered by Molyneux and Benjamin Binns in 2015. The new lap record of the 37 mile (60km) course now stands at 116.785mph. The Manx pair had their first outing at Silverstone this weekend and competing against F1 machines they recorded ninth and 12th place finishes. Their fastest lap of two minutes 22.6 seconds is believed to be the quickest ever F2 sidecar lap of the circuit. Molyneux said: "I've got a couple of good years left in me I hope. I'm 52 in November and I've still got a few more wins in me. "Dan is the best of the lot to partner me as I've got a few unticked boxes to complete before I'm too old."